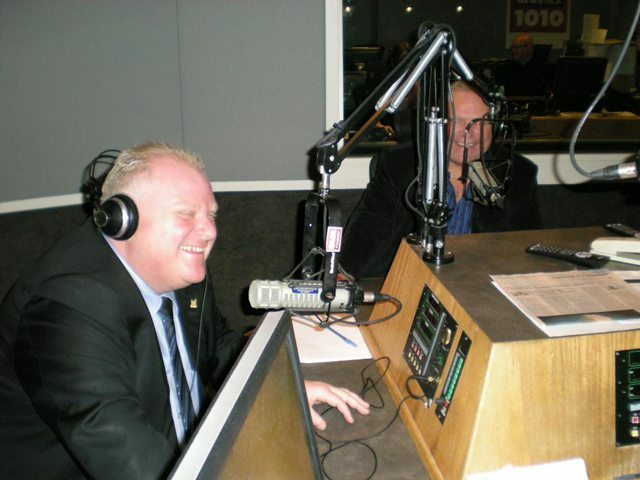 Rob and Doug Ford in the studio. Photo courtesy of Newstalk 1010. What will The City address today? How will our contemporary fireside chat move the public discourse forward in a way that unites our city in finding solutions and building a better future? For that, let’s turn to Councillors Doug Ford (Ward 2, Etobicoke North) and Frances Nunziata (Ward 11, York South-Weston)! 1:08: Rob’s not hosting the show today, as he’s at the St. Patrick’s Day Parade. But he calls in to chat with brother Doug and Councillor Frances Nunziata. They say it’s a day when we’re all Irish and should drink green beer. As someone who is Irish, I say drinking green beer isn’t a good idea, but to each their own. 1:10: Nunziata is Italian, and Doug says the Italians and Irish have a special connection. Presumably Doug recently saw Gangs of New York. 1:16: TTC CEO Andy Byford joins the show, and they’re talking about automated train control. Doug gets really excited by this, because it combines his two favourite things: Andy Byford and shiny technology. 1:19: Doug repeatedly asks whether the rest of the world has this and we don’t. Behind the tiring question of whether Toronto is or isn’t world class, there’s an important point: the TTC’s dated infrastructure makes it lag in technology improvements that would enhance capacity and the customer experience. 1:35: As a way of introducing recently hired Transportation Services General Manager Stephen Buckley, Doug praises the new managers his brother’s administration has brought on. He goes on to say that the administration is changing the culture among all the old managers. Clearly, there is no better way to do this than by denigrating the work of your most loyal employees. 1:40: Now we partake in the time-tested tradition of people calling into talk radio to complain about local road conditions. Caller number one hates Lawrence Avenue East, and we hear murmurs of agreement. Yes, gridlock is bad. 1:42: Doug from North York asks what was going on with the snowstorm in January, as it was tough to make right turns at some corners because of how the snow was piled. Really? Of all the problems highlighted by the snowstorm—the City’s failure to declare an emergency, the problems with homeless shelters, and cars blocking streetcar tracks—there are greater priorities than tough right turns. Let’s have some perspective, folks. 1:44: Not to be outdone, Nunziata complains that some windrows (snow that spills off plows and lines driveways) weren’t cleared. 1:57: Doug Ford is reading statistics about garbage collection. He is literally talking trash and making it as boring as possible. This is not a good radio show. 2:06: Doug thanks the show’s producers for picking great tunes for the intro and outro music; they really are the best parts of the show. 2:06: Doug says one of his favourite words, tickety-boo. Other Ford-favoured words include ‘donnybrook,’ which, as NOW’s Jonathan Goldsbie tweets, makes them like Mr. Burns in language as well as policy. 2:09: Nunziata complains about her garbage and recycling lids being left open after collection and how they then collect rainwater and snow. Look, the little things matter, but only in the context of larger issues and policy solutions. Complaining about having to empty water from your recycling (the lids, it turns out, are left open so a supervisor can easily check that all recycling is cleared) is nuisance politics. One of the chief failures of the Ford mayoralty is its tunnel vision on these minor issues to the detriment of pressing priorities. It’s populism at its worst. 2:30: The show, which has been mind-numbingly boring up to this point, will now discuss a possible Toronto casino. Hopefully The City will finally deal excitement. 2:36: Doug says his number-one concern with a casino is Woodbine (which is in his ward), but he’s confident the Etobicoke racetrack will get what it’s seeking, and he explains why. “This is about jobs, folks. Jobs, jobs, jobs, jobs.” You know he really means this one, because he said jobs four times rather than three. 2:38: Doug, who frequently has small-stakes bets with Rob on the radio show, says he’s not a gambler. He also says that we don’t want Markham to get the $150 million from a casino rather than Toronto. This has a few things wrong with it, as the Globe and Mail reports that Toronto is more likely to get $20 million from a casino, and Markham’s city council has voted against a casino. 2:41: Perennial Ward 19 (Trinity-Spadina) candidate George Sawision calls in, and says that Ward 19 councillor Mike Layton is saying the opposite of what MGM is, so he wonders who is lying. Whatever your political persuasion, I’d suggest listening to international casino operators with a healthy amount of scepticism. 2:43: A caller admonishes Doug for just focusing on best-case scenarios, and points out that some casinos have been going bankrupt, like in Atlantic City. It’s unusual for the show to have critical phone calls, so this stands out. 2:47: Dave from Vaughan calls in and says he likes the show because they talk good common sense. But he’s concerned about what the average wage at a potential casino would be, and says he doesn’t trust the numbers. Doug says he understands, and handles the criticism well. 2:50: A caller argues that MGM and the other big casinos aren’t interested in Markham or Vaughan, so the argument that they’ll set up shop there rather than downtown doesn’t hold water. He goes on to say that he’s done his homework looking at both sides of the issue, and he just can’t believe what the casinos are promising. Although the caller doesn’t specify what he’s referring to, Nunziata tells him that what he’s reading isn’t true. Okay then. 2:52: Sean from Richmond Hill calls in and tells Doug to stop exaggerating his numbers. Waitresses will not be earning $60,000 a year, and Toronto will not be getting $150 million a year. Doug continues to take this in stride. 2:54: Adam from Rexdale calls in and talks about how Woodbine Live! and Woodbine Centre are falling apart and retailers are leaving. He bemoans the attention the casino issue has received while this has been neglected. Doug cuts to commercial. 3:00: The show ends, and Doug gives his customary “God bless Ford Nation” sign-off. For 90 minutes, this was one of the most boring episodes of The City since it first aired, which is an extraordinarily low bar. There was no reference to Sarah Thomson’s unsubstantiated allegations of the mayor’s cocaine use, although we did get callers (whereas we didn’t last week, when Buttgate was top of mind). Unexpectedly, this episode was saved by the callers, who usually provide Toronto Sun online comment board–level analysis. They largely didn’t like the idea of a casino and were very sceptical of what Las Vegas is offering. If even Ford Nation’s chosen people don’t believe the covenant being offered, can Rob and Doug deliver their promised casino? As always, God bless you for reading, Raccoon Nation. Two out of five shiny lights.